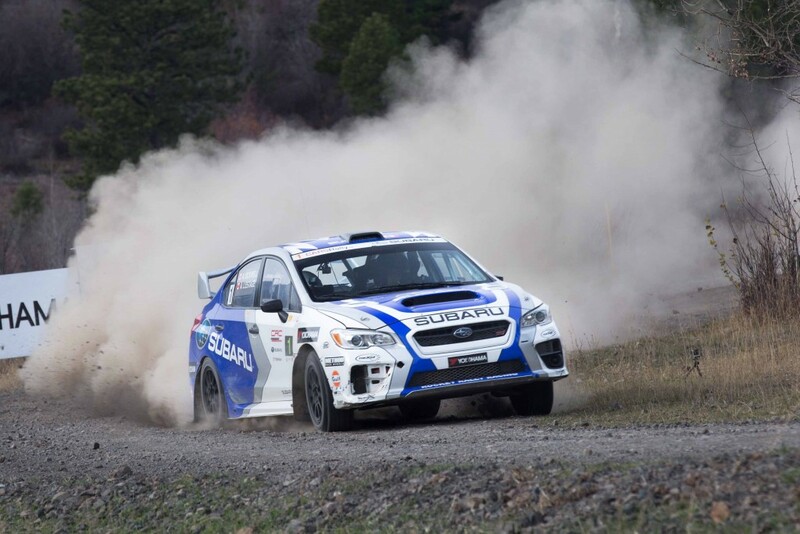 Merritt, B.C., October 25, 2015 – Antoine L’Estage (St-Jean-sur-Richelieu,QC) and Alan Ockwell (Toronto, ON) dominated the 2015 Pacific Forest Rally, L’Estage’s eighth victory at the event. The Subaru Rally Team Canada WRX STI carved out a big lead on the first day of competition and managed their lead through the rest of the event, despite a mechanical failure partway through the second day. “We had a great event with the team and car all doing a really good job,” said L’Estage. “We hit a compression on the Clearwater stage which broke a control arm and then other parts broke, but we were able to make a repair and limp back to service. Driving steady from start to finish were Hardy Schmidtke (Red Deer, AB) and John Hall (Sherwood Park, AB). The team has run over 30 rallies together and quickly showed their confidence over the rest of the field, moving into second place early in the event and holding position to the finish. Josh Shewchuck (Kelowna, BC) and Adam Vokes (Edmonton, AB) struggled with problems on the first day of the event and started day two with strong hopes for changed fortunes. They were rewarded with excellent performances on the day’s stages. As other teams dropped out because of the rough conditions, Shewchuck and Vokes managed to avoid trouble and were rewarded with a third place finish, a career-best for Shewchuck. Dave Clark (Naches, USA) and Billy Irvin (Puyallup, USA) dominated the two-wheel-drive competition in their Merkur XR4Ti. Clark had fitted a new turbocharged engine before the event and found the power really worked to their advantage early in the rally. Despite a strong field of two-wheel-drive entries, the American pair went unchallenged to the finish. The Pacific Forest Rally is the first western event on the 2015 Canadian Rally Championship calendar. Snaking along technical roads in the hills surrounding the Nicola Valley, the event takes place over two days and includes significant nighttime portions of competition. Clear skies and dry roads provided ideal conditions for competition. The Canadian Rally Championship is comprised of six events held nationwide in a season that extends from February to November. The series is presented by Subaru Canada, supported by Yokohama Tire Canada and features a contingency program from Subaru Canada. The Canadian Association of Rallysport (CARS) is the official sanctioning body for rallying in Canada. motorsport sees drivers and their co-drivers take modified road cars to the limit as they achieve blistering speeds over closed-road courses that typically cover more than 150 kilometers of gravel, dirt or snow-covered roads. Fans can get up close to the cars in the service areas and catch all the action from designated spectator points located at the best spots on the route.